Happy Jubilee! Sorry for my absence for the last few days, apart from shooting on Thursday, I was at Epsom on Friday helping to pick contestants for the style competition with WhatBestToWear.com which was great fun - I'd never been to the races before so it was a really fun experience. So, technically, this jumper may not be classified as bright seeing as the base colour is navy but let's just play along and go with the red stripes as a bright today in honour of the Queen's Jubilee yes? I picked up this jumper a few weeks ago in the Jaeger flagship - while the sale has yet to kick in fully, they had a few items already on sale, including this jumper, down from £99 to £75, you can still get it online [here]. While we haven't been anywhere near the Thames today, we have been toasting the Queen (repeatedly) in the pub. Even Holly the sausage has got in on the act, wearing her Union Jack jumper. Worn with: khaki skinny jeans, Topshop; Union Jack socks, Marks & Spencer; Black canvas high-tops, Converse. 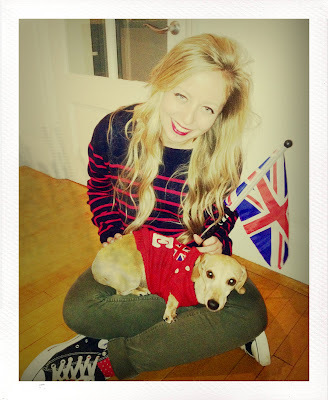 Holly wears: Union Jack LOVE jumper, Monsoon.